Sea kayaks, Grass and some Water! Parting the Sea of Grass in Shark River Slough, seat-of-the-pants view. Aerial view paddling down “Main Street” on the Shark River Slough. CLICK and resize for full screen VR 360 Panorama! On the Shark River Slough under a big sky. CLICK for zoomable superwide fullscreen VR panorama! A trip down the length of the Shark River Slough is about 35 miles from the northern Everglades National Park boundary on US Hwy 41, down to the old Indian mound on Avocado Creek, now called the Caneptach campground. You essentially traverse the entire Everglades National Park, from top to bottom. There is of course a lot more to the entire Everglades watershed with water coming down from Lake Okeechobee , and even further up from the headwaters of the Kissimmee River (dubbed the Kissimmee -Okeechobee-Everglades : K-O-E system). Shark River Slough is the “big one” .. the River of Grass, and along with the smaller Taylor Slough drains the Everglades into Florida Bay. Although Shark River Slough is a large and major feature of Everglades National Park, it is just about half of it’s historical flow. Historical flow of the Everglades “River of Grass“, shown below (bordered in white) dwarfs the current flow “regime” (olive green). ALL the water coming down the K-O-E system, through the Everglades Agricultural Area (EAA) is engineered and controlled by the SFWMD with a 1400 mile system of levees, canals, gates & pumps. This is unlikely to ever change, unless all 7 million people living south of Lake Okeechobee somehow moved away up north! The Everglades watershed will never be like it was 100 years ago, however limited restoration efforts are finally underway as part of the Comprehensive Everglades Restoration Plan (CERP). With more research, hydrological & habitat restoration, maybe by 2050 we will see a functioning Everglades! Trip in perspective: traverse current remnant of Shark River Slough from north to south, the whole span of Everglades National Park from top to bottom! Trip route across the Everglades in red with major points totaled approximately 70 miles through Sawgrass Prairie, Shark River Slough, River & Mangrove habitats. 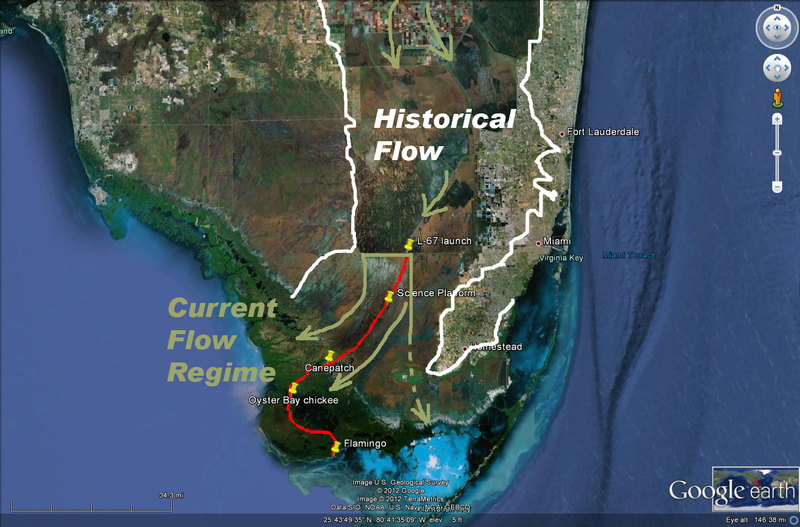 Water flow through the Everglades Hydro System: past, present & future? Note current small remnant flow of Shark River Slough. This trip was organized by Chris Carl, working in conjunction with the Arthur R. Marshall Foundation as a “trial run” for a future trip which will be the third leg in a series of educational outreach expeditions to inspire k-12 students to learn, understand and care about enough to appreciate our unique World Biosphere “Everglades” Ecosystem! 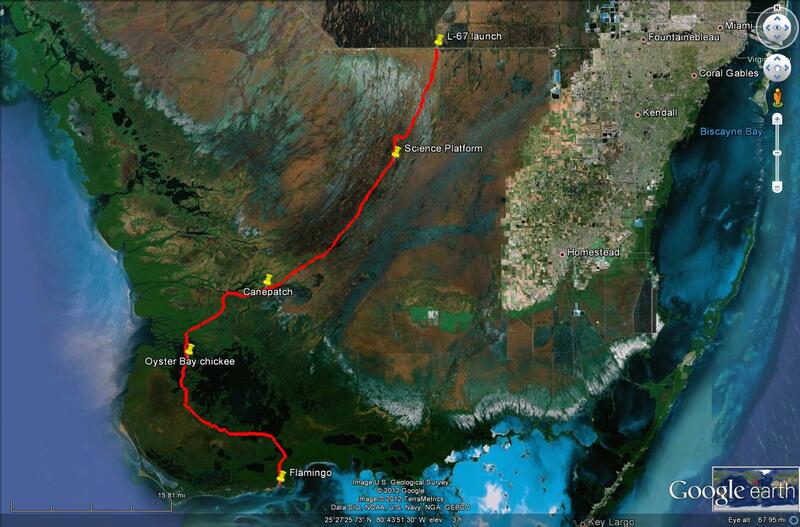 The first leg involved paddling down the length of Lake Okeechobee from the mouth of the Kissimmee River down to the Grassy Waters Catchment Area following the actual path of the drinking water supply for Palm Beach County. The second leg followed the water flowing south from the lake down the canals in the Water Conservation Areas to the northern Everglades National Park boundary on US Hwy 41, the Tamiami Trail. The third leg will complete the journey, tracing the water flow as it empties into Florida Bay, putting the ecology and hydrology into perspective! For me this mini-expedition has been the fulfillment of a dream of many years to be able to traverse, see and photograph this entire section of Everglades National Park. A huge thanks goes out to Terry Helmers, Chris Carl and Charlie Arazoza for their guidance and making this trip possible for me! I have learned a lot along the way, and even more so in researching this article for you. I trust you will enjoy the photography and learn as much reading along!! Group gathered on the old Tamiami Trail adjacent to the L-67 Extension canal, preparing to launch. 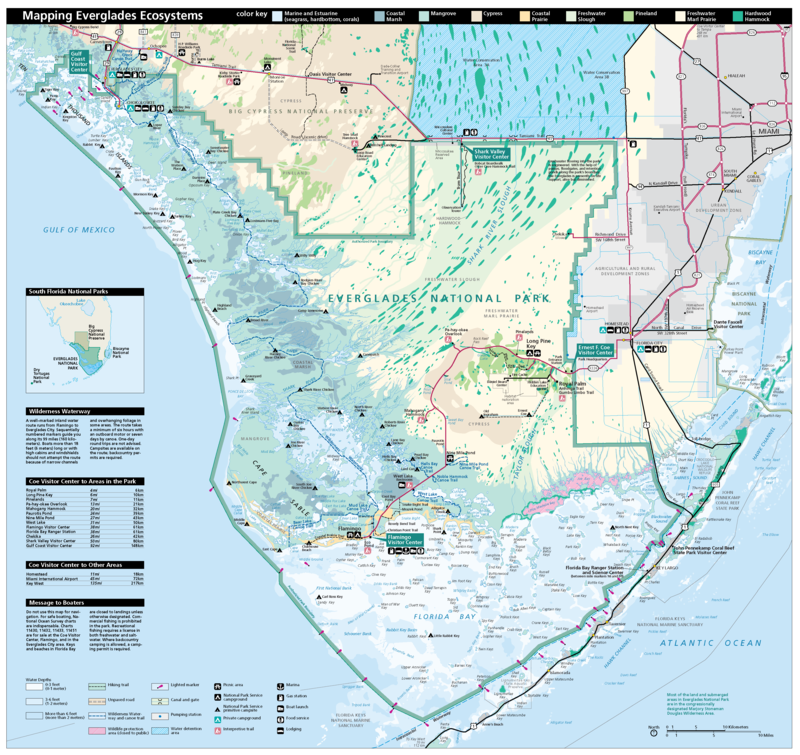 L-67 Extension is a day use area with access into the north sections of Everglades National Park. Note the complete lack of bullet holes in the sign! Everglades Restoration work being done in WCA-3 on the north side of Tamiami Trail. Exotic species release is a major threat to the Everglades ecosystem! Launching off the Tamiami Trail / Us Hwy 41 into the L-67 extension canal was chosen after some discussions. Ideally it would be great to be able to launch from nearby Shark Valley (by the “Jetsons” tower). Currently this would present some logistical and practical challenges for the intrepid paddler. Perhaps in time the Park administration can be persuaded to see the benefits, allow overnight launching and authorize the Shark Valley Tram concessionaire to shuttle canoes/kayaks down to the tower. It would really open up a whole new world of possibilities for backcountry paddling the upper realm of Everglades National Park! For this trip launching into the L-67 Ext canal (via a drop-off) worked out fine, and has been field-tested by Terry a few years ago already. Also, in general you do not want to park along the L-67 Extension levee overnight nor should you block access to the levee gates at any time! As it is, the L-67 extension canal (which is a dead-end and a direct discharge of canal water into the Everglades) isn’t terribly exciting for paddlers (although apparently can be good for fishing). The canal was dug in 1967 along the original boundary of Everglades National Park (c. 1947), and effectively split the Shark River Slough into two. Since the Everglades National Park acquired the East Everglades Expansion Area in 1989, this canal is scheduled to be backfilled and the levee removed as part of Everglades restoration plans. This, along with decompartmentalization of WCA-3 to the north and raised portions of Tamiami Trail – the “Everglades Skyway” will result in much improved water flow and quality for the slough! As a side note, this area will one day soon be part of the River of Grass Greenway (ROGG) which will connect Miami and Naples via a non-motorized recreation foot/bicycle path paralleling the Tamiami Trail – how cool is that!! This temporary culvert “creek” has been cut to allow excess water from WCA-3A to drain into the L-67 Ext canal pictured below. Water levels were unusually high with strong flow. Aerial crow’s-eye view of top of L-67 Extension canal into which we launched one early foggy morning. Kra, kra .. kra,kra! At first glance one might be tempted to paddle down the length of the canal and then veer off into the SW into the slough. However, the brush gets thicker the further down you go, plus it’s a real boring paddle down a canal. Instead you want to break out of the canal a little over a mile down & get going! Breakout off L-67 Ext canal to the west is just over a mile down the canal, but is not immediately obvious. There are probably several breakouts that could be used. Breaking out of the canal, you have to bust through westward about 20 – 30 meters of thick sawgrass. Here water levels have to be high and be ready for hand-to-hand combat .. make sure you have your GLOVES !! Terry and Charlie launched ahead of the rest of our group which consisted of Chris & Susan in a sleek tandem sea kayak, myself in 20′ sea kayak, and Robert (Bob) Carew & Victor in shorter river touring kayaks. So our first task was to meet up with Terry & Charlie who were a few miles ahead, scouting out new path possibilities. Once out in the open prairie you are free-ranging, avoiding shallower spots, picking the “least-vegetated” route – wide open vistas! Also mobile phones DO work in this section close to urbanization! You have to be willing and able to stand up in your chosen boat, otherwise you can’t see where you’re going. Here I’m, standing in my 21″ wide sea kayak – holding on to my greenland stick paddle for support. It took close to two hours before we were able to make our way to them, paddling through the sawgrass praries is slow and tedious at times. We were completely free-ranging, picking the “best” routes as best we could, using known GPS coordinates and even getting on the mobile phone to call Charlie for directions! This worked out pretty good, but in the end it was good old whistle and line-of-sight that led us to Terry and Charlie in the grass. I followed a slightly more southerly course than the rest of the group and heard two distinct sets of whistle sounds from opposite directions. After several times standing up in my kayak, I was able to spot a waving paddle in the distance. In this country you’ve got to be able to stand up and see beyond the grass or you’re not going anywhere! I found that standing up in a 21″ wide sea kayak is totally doable, as the grass hugs and helps to stabilize the boat. In deeper sections I’d have to lean on my Greenland stick paddle for support. Paddle UP – so other’s can see where you’re at! Working our way in a general SW direction. Overall I can definitely recommend a Greenland stick paddle for this kind of paddling. It picks up and throws less vegetation than a euro-blade, plus you can literally use it as a ‘stick’ when you need to! As a spare I also brought a wing paddle for deeper water, if I needed to power through something. Group paddling on the River of Grass. Stay close, else group will disappear quickly into the grassy landscape! Navigation check with Terry – our guide into the wilderness. A seemingly operatic moment on the prairie. Aerial view paddling kayaks on the Shark River Slough in Everglades National Park. Terry Helmers is the quintessential backcountry paddler, truly a modern day Everglades exploration pioneer. His knowledge was essential to our trip, and in fact he led us “into the wilderness” to intersect an east-west section of an airboat trail. I asked Terry how one would know where this was if one “didn’t know” where it was, and he said “you wouldn’t” (at least without him and/or the GPS coordinates) .. then we parted ways after 2pm and Terry headed back to explore solo along a different route back to the L-67 Extention launch spot. Across onn the other side of the L-67 ext canal/levee is little known but historic Chekika Island in the slough. CLICK for story: Chief Chekika’s not so secret island hideaway in the Everglades! Terry ambles on, seemingly effortlessly, yet deceptively quickly in his canoe! He launched ahead of us, scouting out new paths ..
Kayaking the River of Grass or more like a Sea of Grass. Periphyton – base of the Everglades food chain. Lily pads and periphyton on the River of Grass. Out here, you hear EVERYTHING! There is silence here, but more often than not, we would hear distant rumbles and the sounds of machines. Airboats from the “Everglades Ecotours” tourist rides just east and north of the park, the buzz of many small and private planes flying and training overhead .. airliners on final approach to MIA. The Shark River Slough feels remote, but is not nearly as quiet as the Taylor Slough. Day 1: A strenuous 16 miles of grass paddling to the Science Platform! 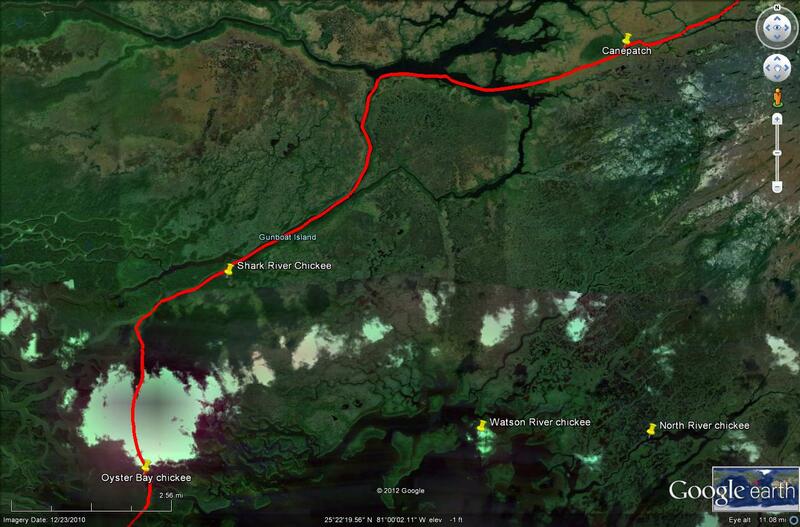 Here is the heart of Shark River Slough from US Hwy 41 to Bottle Creek, which was the “expedition” part – off-map, part free-range, although mostly running along an old airboat trail dubbed “Main Street”. Charlie Arazoza of – www.bushpaddlers.org – paddles by a small hammock. Paddling in this upper section of the Park is true grass paddling, a seemingly endless realm of water and grass punctuated only by tree hammocks of various sizes. Many of the larger ones were used in the past by native Indian tribes, and later by Gladesmen as hunting camps, etc. On our route we came within just a few miles SE of the Shark Valley tower, and we could see it’s distinct shape in the distance. Even closer, we were within 8/10’s of a mile from Seagrape Hammock (just south of the tower marked as “HARDWOOD HAMMOCK” on the free Park map). This is the very same hammock as that christened “Willoughby Key” as part of H.L. Willoughby’s expedition exploring the Everglades during his stay there in 1898 (he was using this kind of an old Army map). He wrote an entertaining account of it in his book “Across the Everglades” – a good read (download a free electronic version). Willoughby noted after climbing a tall tree and observing with a telescope that he must be in the east-west center of the Everglades, and he wasn’t far off! Shark Valley ‘Jetsons’ tower in the distance, only about 3 miles away. Seagrape Hammock aka “Willoughby Key” less than a mile away was apparently a great camp back in 1898 and before! While we didn’t have time to stop at Seagrape Hammock on this trip, I was able to kayak out to “Willoughby Key” with a friend in the winter of 2014/15. Click the pic below for the full pedal + paddle/bicycle + kayak story! Water gauging station, upper part of Shark River Slough. On the critical section where we would come to intersect what is called “Main Street”, I lagged behind taking pictures and just enjoying the views. Unknown to me while I paddled to catch up, I had left my little waterproof camera laying on the kayak deck. When I reached for it several minutes later, it was gone – it had rolled off into the drink! I knew it would float in it’s neoprene case, so I had to try to retrace my steps. After what seemed like an eternity, and several times standing up to look for it, incredibly, I spotted it floating in the grass on the edge of what will surely be a gator hole in the dry season. What luck!! I could hardly believe it! Of course in the thick grass I couldn’t turn my 20ft sea kayak around, so I had to climb out and wade out to retrieve it and then hurry to catch up with the group, thankfully waiting for me and wondering “what the heck is going on! ?” A real sigh of relief as we cruised down “Main Street”, which is a well defined airboat trail that runs down the middle of the slough all the way into Bottle Creek on the southern edge of the slough. Water depth averages from about 1 to 4 feet, but feels “heavy” due to all the vegetation. I found a Greenland stick paddle to work very well here. Our plans were to set up the first night’s camp on one of the large “Science Platforms” experimental flumes of which there are a few to choose from. We were able to make it to our No 1 choice, just off “Main Street” and just before sunset (it is pretty close to the “S” in “SHARK RIVER SLOUGH” on the free Park map). We received permission to do this via a “Special use Permit” from the Park. Aside from these Everglades flume platforms, there is no dry place to get out, and we’d have to attempt to sleep in our boats. This might work in a canoe, but in a kayak .. we’d be just waiting for dawn (and yawn)! Camp Flex on the Everglades science platform flume in the slough, first night. The structure is in the process of being taken down, the wood is old, rusty nails sticking out, the foam floating dock boards half waterlogged, not really much room to set up tents. Eventually we arranged it so that two tents could go up, while others found some room at opposite ends of a ledge next to the tents. I elected to take the “south side” and set up my sleeping mat on the 3 foot wide walkway next to my kayak. After the moon set it was clear for a while and the stars came out, although the light pollution from Miami spilled out far into the sky and so I couldn’t quite make out the Milky Way. Throughout the night there was frog talk, which sounded a lot like gator grunts, and a spattering of skeeters that would be just enough to be annoying! Eventually I crawled into my netted jungle hammock splayed out over the wood and metal posts and still woke up about 20 times during the night. I slept out under the stars and did not get rained on, but everything got damp from the condensation. It gets really wet out here! After dark on an old “Science Platform” Everglades flume structure for which we received special permission to use. Note strong glow from Miami metro area, the edge of which is only 12 miles away here. Moon setting over Science Platform flume where we “camped” for the first night. It was better than sitting in the kayak all night! The Everglades flume structure is geometrically and visually interesting, somewhat reminiscent of the International Space Station! There are five floating cat walks attached to the main wooden walkway anchored on pilings. Even more ISS-like, triangulated steel antenna towers keep the catwalks separated and aligned in the slow moving current of the slough. These experimental flumes in the Everglades appear to have been constructed in the mid-late 1990’s to study the effects of phosphorus loading on the slough, presumably via runoff from the Everglades Agricultural Area just upstream of the slough flow. Warming, golden morning light on the Science Platform makes the grasses glow. Aerial buzzard’s-eye view of Everglades Science platform flume in the morning. The next morning we faced about an 18 mile paddle down to the the Canepatch campsite. As we moved further and further SW, the airplanes and associated noises finally went away and it was just beautifully quiet and sunny! The deeper spots will likely become gator holes once the water levels drop. An empty Apple Snail shell rests on a mat bed of periphyton surrounded by Spike Rush. Paddling down “Main Street” – an old airboat trail still used by the Park Service and Researchers conveniently leads down the center of Shark River Slough. A fisheye selfie-rama on the Shark River Slough! There was not as much wildlife to be seen out here as I had hoped for. This could be the way it’s always been or not, and likely due to the high water levels we saw – the wildlife is totally dispersed. But this is the only time you can actually do this trip – the slough picks the time FOR you! We did see some Ibis, a few Herons & Osprey, a buzzard or two, possibly a Kite and a turtle, but no alligators. Lots of dragonflies, and thankfully biting bugs were almost non-existent in this wide open country! Boisterous caterpillar on a sawgrass blade. Flowering Duck Potato stalk in the slough. Even when you don’t see any trail markers, you can often see the “dip” in the vegetation, tells you are on a trail. Some day soon I’d like to spend a couple or three days just out here under that big sky! Nearer the lower section of the Shark River Slough the landscape is vast in every direction and nice and quiet! Water depth was about 4 feet here, but it felt more like just a foot. Day 2: from the old Science Platform to the Canepatch campground totaled about 18 miles straight down the Shark River Slough. Paddling down the middle of the slough, staying on the lines of “Main Street” is pretty easy. There are regular markers on this airboat trail, although sometimes very far apart. Nevertheless, you “go with the flow” so to speak, sticking to the deepest water you can see. Even a one or two foot “dip” in the vegetation is a sure sign of the trail. Although the water is around 4 foot deep, the paddling is “heavy” due to all the vegetation underneath you. Through the thicker sections we’d go single-file, more often we’d ride side by side. Later on in the afternoon, approaching the mangrove “wall” directly ahead with Charlie leading the way. This was a sure sign of brackish water ahead and that we were close to the coastal mangrove habitat of the Everglades! It’s at this point it starts dawning on you that soon you will exit the open vistas, you begin to see the landscape change in the distance. Eventually, a wall of mangroves appears on the horizon. The last of the vista views of the open Shark River slough prairies! Not to worry though, as “Main Street” dumps you straight into Bottle Creek. While “you was paddling”, the transition is immediate & all of a sudden the open prairie is GONE! It’s really beautiful to see this transformation of your paddling environment, and I felt a nostalgic loss. I guess I wasn’t mentally quite ready to leave the slough just yet! Looking back NE from Bottle Creek, a little sad to be out of the River of Grass! These are the Mangrove “fingers” in the distance that jut out into the prairie from Rookery Branch. Several times I “pulled over” so I could stand up in my boat again and catch the last glimpses of the slough we had just left. Bottle Creek carries you into Rookery Branch, named for the very large numbers of White Ibis that used to nest here up to the 1930’s (before the canal and levee systems upstream reduced the water flows and eventually food for the birds). Pictured above are the other “fingers” of the Rookery Branch mangroves that stick out into the slough. You can see these even on the free Park map! Weather data reporting station at the Shark River headwaters of Rookery Branch. Water Lily bulb in Bottle Creek. Spider Lilly in the warm afternoon sun. Negotiating tighter mangrove sections of Rookery Branch. Mangrove tunnels overgrown but with visible cut marks from the past. There is another, straighter way to go around slightly to the north into Rookery Branch. After a while, Rookery Branch opens up into a wide still creek of glassy smooth water. 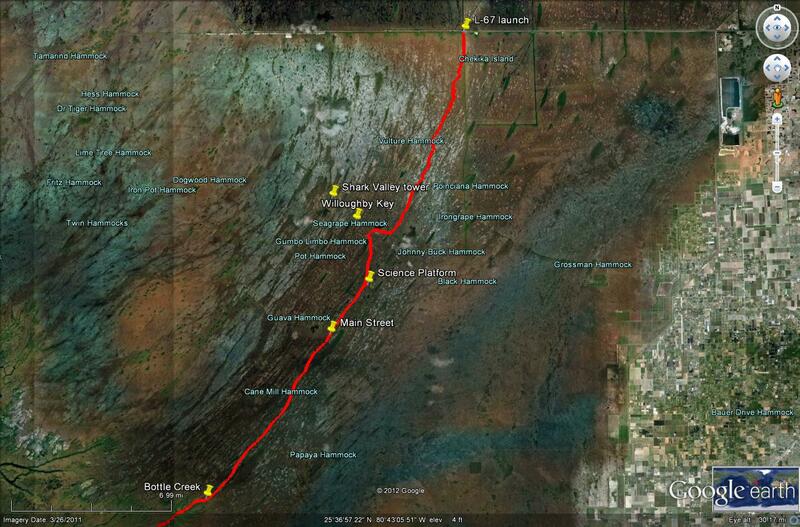 Now it’s just a matter of following the meandering headwaters of the Shark River down to the Canepatch campsite. This was easy, quick paddling in the late afternoon sun and the time was short! All of a sudden, the campground appears suddenly behind a bushy mangrove on the right side at the top of Avocado Creek. Getting late in the day, speeding along on final approach to Canepatch campground. Dock at Canepatch campground on Avocado Creek. Canepatch is a large clearing with a small dock! Previously called “Avocado Mound”, it is an old Indian mound, one of the very few pieces of solid land. It features lots of space, two picnic tables (with resident roaches! ), and a now overgrown hiking trail leading northward. To us it was “deluxe” and afforded the most room of our three night’s camping. After cooking dinner & trading stories under the stars (campfires are not allowed), we settled off into a full night’s sleep. My only complication was that my tent pole snapped, so I had to wrap it with a splint and duct tape. This worked, but the tent sagged badly and I woke up a couple of times in a “claustrophobic sting” with the top inches from my face! I walked around in the middle of the night, the water off the dock was super still & reflected the stars beautifully. At that point I wished I had brought along a full sized tripod (height) to capture that perspective .. c’est la vie. There were fewer bugs than I expected, but they were there. The Cane Patch clearing pictured below has plenty of space for larger groups and the Park does maintain the camp area to some extent, though it is one of the more remote areas of ENP. Beware that if you are sensitive to poison ivy there is a lot of it about!! It’s also a very damp campground – everything was wet in the morning! Aerial bird’s-eye panoramic view of clearing at Canepatch campground in the morning. The Cane Patch also has papaya and banana plants growing! Day 3: from Canepatch campground to Oyster Bay chickee platform amounted to 13 miles of river paddling, we were off the water just after 2pm. Our third day of paddling was by far the easiest! We had wind and current in our favor and zipped along effortlessly. Sailing downwind on Tarpon Bay, doing about 4 knots here! A fork in the road at the west end of Tarpon Bay! Shark River on the left, the Harney River to the right. Both empty out into the Gulf. Alligator basking in the sun on a mud bank of the Shark River. Once in the Shark River, we paddled along an official section of the Wilderness Waterway and followed it along to our next night’s camp at the Oyster Bay chickee platform. Thanks to the favorable conditions, we did a full day’s paddle in less than half the time, giving us extra time to soak in the sun and enjoy the afternoon. Cruising into Oyster Bay in record time, thanks to a favorable wind and tide situation – a full day’s paddle in less than half the time! Low tide arrival at Oyster Bay chickee. Aerial view of the newly renovated Oyster Bay chickee. The toilet “facilities” at Oyster Bay chickee look brand new and the cleanest I’ve ever seen anywhere in Everglades National Park! Panorama of our camp at Oyster Bay chickee. CLICK for superwide interactive panoramic! Oyster Bay chickee looks have have been recently renovated with new “plastic” wood planks and roofing along with a brand-new toilet! If offers excellent backcountry accommodations and faces into prevailing winds. It is situated right next to the mangroves, however, so no-see-ums will get to you at dusk and dawn! Beautiful: a rainbow over Oyster Bay in the afternoon light! Chris making a makeshift kayak skeg out of a piece of found junk -actually a discarded coffee pot. That’s ingenuity! Oyster Bay chickee under the moonlight. It was a nice night with a light cool breeze. We enjoyed a gorgeous night under the setting moon and stars. This was our best night camping of the whole trip! Later on, Oyster Bay chickee under the stars! Morning sun lights up a colorful tent! Day 4: Oyster Bay chickee back to Flamingo via Joe River was the longest at about 23 miles and we made it with a few minutes of daylight to spare. Dolphins hunting along the mangrove roots on Joe River. Entry channel into Coot Bay following tourist boat, set off a nice wake for surfing! Cruising down the glassy water of Buttonwood Canal towards Flamingo. Arrival at Flamingo just before sunset. The skeeters were ready and waiting for us! As we reached the end of the water in Flamingo, I felt both a sense of relief and a bit of sadness that the trip was over. I am sure I wasn’t the only one! Even though we were greeted by mosquitoes, our spirits were high with a sense of pride and accomplishment. We were able to deal with unexpected situations in positive and constructive ways .. an outstanding trip with the excellent company of a very capable and knowledgeable team! Very special thanks to Gisa (c/o Chris) for the banana bread, post trip snacks and food – MOST appreciated!! Also to Robert is Here (he WAS there!) for allowing us to “picnic” in front of his store even if closed! To learn more about Florida Bay and the Everglades, I can recommend this informative and beautifully done book. There is a wealth of information inside along with incredible images by internationally recognized and top local Everglades photographers. If you like Florida Bay and the Keys, you will LOVE this book! © 2012-2015 Flex Maslan / kayakfari.com / awakenthegrass.com. All original photographs, artworks and music in this portfolio are copyrighted and owned by the artist, Flex Maslan, unless otherwise noted. Any reproduction, modification, publication, transmission, transfer, or exploitation of any of the content, for personal or commercial use, whether in whole or in part, without written permission from the artist is strictly prohibited. Flex, you captured this trip as only a true artist could. The pictures are fantastic! Loved the pictures and story! Never seen a dolphin in the mangrove before!! Read it again & relived it again! And thanks for the prints! can you please suggest a route for a begginer for maybe 2-3 days? 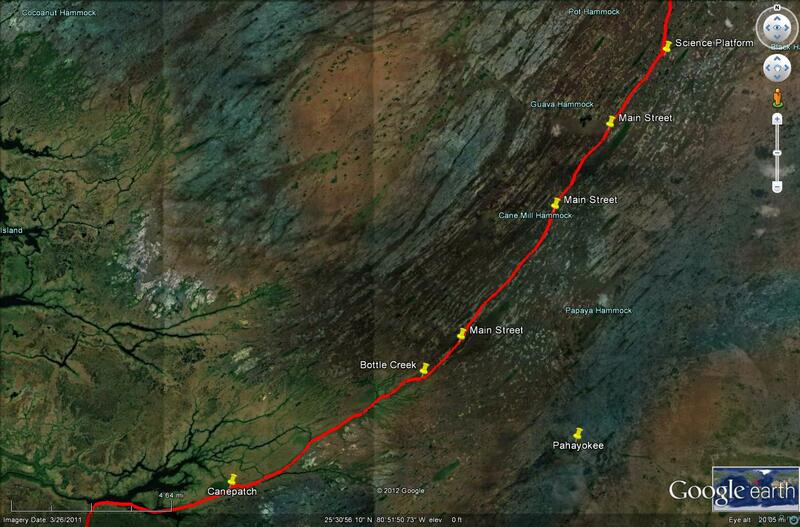 flamingo to shark river inlet? which is the best month to go? Hi! Good way to start could be to launch at Coot Bay Pond and paddle up the Joe River (there are two chickee platforms there). From there you can stay at Oyster Bay chickee ( https://kayakfari.wordpress.com/trips-sea-stories-pics/random-gallery-2/florida-south-florida/everglades-national-park/interior/oyster-bay-chickee-camping-platform/ ). It’s just a short ride out to the Gulf from there! Go anytime, but just like anything in the Glades, best Nov-April. Just to expand on the master’s recommended route. From Oyster, if the weather allows, you can go out the shark and back home via the cape. Or, if the wind is up, you can go back the way you came, or go back along the rivers on the north side of whitewater bay. -do you know of a good/detailed on-line map for these routes please? Summer gets sticky & buggy. I prefer bug free, having to hunker down tight at night & waking up cold, to sticking to my bedding and staining my tent ceiling red then waking up and sweating hard for X days with no chance of a shower. 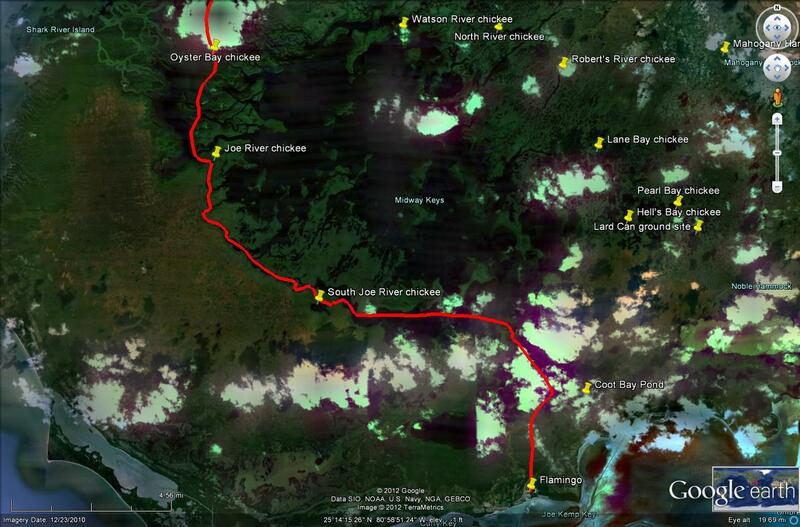 http://gladesgodeep.ning.com/ and http://evergladesdiary.com/ have quite a bit of route guidance. I’d like to add that either of the two chickee platforms in Florida Bay are great (the only?) summer camping opportunities – there’s always a breeze and few if zero bugs. Just watch out for the PM thunderstorms .. that’s your real wildcard! awesome! thanks guys. looks like november it is! No reservation till day before departure…& you have to do it in person! If you’re new to Everglades camping, this might seem like an awkward system. However it actually works well and keeps the camp sites from being gobbled up by large tour operators ahead of time. There are also other camps just outside the Park’s jurisdiction that require no permits. Hi Susan! Glad to hear from you!! Flex, tell the truth, You were just missing her key ring! Susan, we miss you! Come back, even if it’s for a little while to play!